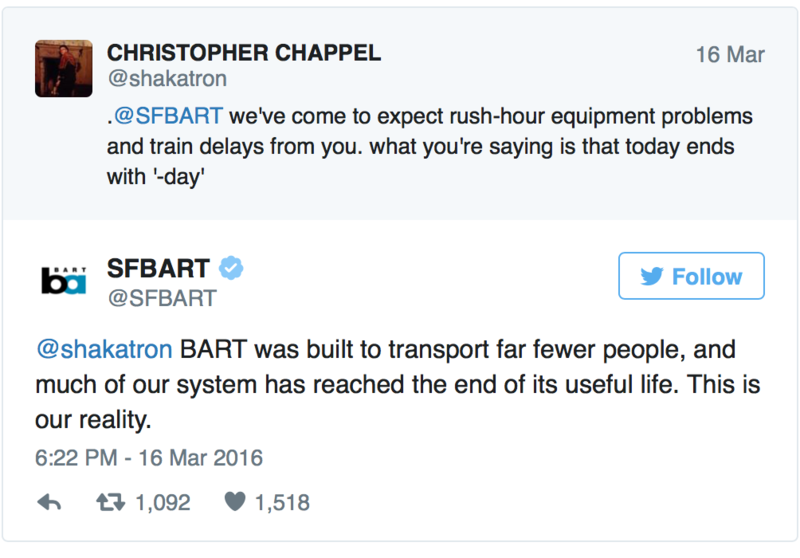 Last week, Taylor Huckaby was manning the Twitter feed at San Francisco’s regional rapid transit agency, BART, during a tough morning. Mysterious electrical faults were causing cascading delays, and Twitter boiled over with rage. Suddenly, Huckaby started tweeting in ways that got attention. Inspired by Huckaby, let me put this more generally: Politeness and deference are always the first impulse of transit staffs dealing with the public, but sometimes politeness turns into a habit of apologizing for everything and anything, and at that point, staff is consenting to abuse. Few public servants take as much public abuse as transit agency staffs do, almost always because of problems that are out of their control. Imagine Huckaby’s position. His job is to communicate on BART’s behalf, but because of decades of decisions by past leaders (regional, state and national, not just at BART), his beloved transit system is betraying its customers. It’s certainly not Huckaby’s fault. In fact, he understands the issues well enough to know that it’s probably not the fault of anyone working at BART today. In this situation, the usual vague apologies would amount to misleading the public. Huckaby deserves his heroic moment, because he did exactly what transit agencies need to do: Find the courage to say the truth, because while people will yell at you when you do, nothing will ever improve if you don’t. But don’t let me make that sound easy; it’s not. Some of the early coverage, including that Vox piece, gave the impression that Huckaby had just snapped, “lost it,” gone rogue, but Huckaby has now spoken up to justify his comments, stand up for transit staffs, and properly blame some of BART’s problems on a broader US tradition of infrastructural neglect. BART management seems to have his back, and Los Angeles Metro tweeted this great video snippet, suggesting that they do too. Mad at how bad your transit service is? Maybe the problem is with people and cultures at the agency now, but maybe it’s because of decisions made at higher levels — regional, state, and federal — often outside the agency. It’s easier if all those people if the frontline staff takes the blame, and are trained to just apologize all day. But that never solves the problem, and what’s more, it’s abuse. How International is Human Transit? I disagree with just calling it abuse. A nuanced portrayal would be that BART did spend millions of dollars on poorly performing, possibly Title VI violating projects like the Oakland Airport Connector. Rather than extract greater performance concessions from labor in the 2013 contract negotiations, BART threw in the towel and gave labor well more than their original last best and final offer, with little ceded in work rule changes. The police force has had plenty of costly issues and paid millions in settlements due to its treatment of its customers, and the ex general manager continued to earn vacation and sick time even after she was fired. While it’s not Huckaby’s fault, the criticism goes to the agency as a whole and not to any names individual. I don’t condone name calling but the comment posted above is well within the bounds. Many interesting thoughts generated by this post. In my 40+ year career in transit planning and operations, I have felt that transit agencies often are not open enough to their constituents (passengers and the public at large) about faults and successes, both short-term and long-term. Far from trying to avoid criticism by keeping a low profile, or by dismissing (and thereby passively enduring) public complaints as a “fact of life”, I believe that lack of transparency just fuels a rage and mistrust, especially of public agencies. By not rocking the boat, we may capsize in the sea of public opinion. From a passenger’s point of view, a delay is a delay, and thus an inconvenience, minor or major, whatever the cause. At the high level, it is our responsibility to get the passenger to his or her destination safely and reliably, managing as best we can the conditions and obstacles that are nominally within our control (staffing, equipment reliability), as well as those that are at least partially beyond (traffic congestion, adverse weather, interruption of utility power, emergency services blockades, vandalism, intentional and unintentional passenger actions, etc.) To some extent, most people will cut us some slack for things that are reasonably outside of our immediate control. And I think most people will suffer through the occasional big delay if it doesn’t look like gross negligence of operation or maintenance. But it does get tough maintain credibility if we pitch a new “oh this has never happened before…” every few weeks. If a bus doesn’t show up on time (or at all!) the passenger (likely also a taxpayer and voter) will most likely blame the transit system, whether that is fair or not. If you are stuck in traffic in your personal automobile, you may be unhappy, and have vague complaints about the city, state or province; but you probably can’t personify the alleged culprit, and you might be able to navigate around a specific blockage, which you can’t do as easily on a bus or train. So the transit system gets beaten up, with negative impacts on public and political support, for more than its fair share. For the operations department, it means a lot of day-to-day fast footwork around unexpected, or locally uncontrollable impediments, which includes their inheritance of deferred maintenance, upgrades, or expansion. However, the agencies need to be addressing persistent “external” issues at a different level. On the bus side, agencies in many (most?) large cities are facing increased traffic delays, which means it: a.) more to b.) deliver slower service, probably with c.) less reliability, and therefore with longer average wait times, and more overcrowded trips. On the rail side, deferral of capital replacements and upgrades, due to fiscal constraints, can make it tougher for daily O&M, although can’t always be an excuse for poor daily maintenance. Transit agencies need to identify the costs and constraints that impact the desired level of service. Transport for London publishes very extensive analyses for rail (somewhat less for bus), which measures and classifies delays on a number of dimensions. I haven’t checked other agencies closely enough. While most riders aren’t going to dig into these, the nerds (like me) who do, can sometimes help to deflect unfair attacks, and it gives the PR folks some leverage to refute blatantly dishonest claims. Public funding is inherently “political”, with an unfortunate degree of volatility that leads to unexpected victories and defeats, ultimately more expensive than what might be labelled as “good business practices”. There are too many examples of agencies that have borne wasteful costs of major service reductions and layoffs; and then have to scramble a couple of years later to retrain and regain lost ridership. (That’s a whole other topic of sustainable long term funding and policy.) The catch is that it is difficult for transit management to go head-to-head against elected representatives if there isn’t a committed political champion. (I would suggest that this has been a factor in Vancouver, where attempts to de-politicize transit governance may have been a bit too successful, contributing to defeat of last year’s provincially mandated plebiscite.) It certainly won’t do transit agencies any good to “cry wolf” or be perceived as failing to make the best use of resources that they do have. But it’s also not helpful if the public is repeatedly blindsided or feels taken hostage for billions of dollars in ransom that they hadn’t really known about. Overall, I believe that transit agencies (from governing boards, through senior management, public communications officials, and staff at large) need to build and maintain long term public trust and empathy, which starts with the day-to-day focus on safe, reliable service (“dependability” to the passenger), with consistent messaging about long term options, including how well current trends will meet the always-optimistic long term “vision” statements. To that end, Taylor Huckaby’s refreshingly blunt responses at BART have at least opened up some useful discussion about how to move forward in this fishbowl world. Oh and Jarrett: I gave their outbound planner for her birthday BTW, a gift-wrapped copy of your book.